52-year-old Scott McCarron fired a final round eight-under par 64 on Sunday to win the 2018 American Family Insurance Championship. McCarron posted a three-round score of 15-under 201 for a one stroke victory over Madison’s Jerry Kelly. He finished two shots better than Fred Couples, Colin Montgomerie and tournament host Steve Stricker. McCarron birdied five of his last 10 holes to earn his 15th professional victory and seventh on the Champions Tour. He pockets $300,000 for the victory. Jerry Kelly shot a seven-under 65 and had a one shot lead through 16 holes before missing a 10-footer for birdie on 17. He parred 18. Stricker shot a seven-under 65 on Sunday, but his two-over 74 on Saturday turned out to be the difference. The American Family Insurance Championship has finalized contract extensions through 2020. The extension calls for the event to continue at University Ridge, which will undergo a number of improvements, including Bunker renovation, expansion of the players’ locker room and dining facilities, expansion of tournament operations staging locations as well as other on course improvements. This years event will be held June 18-24 at University Ridge in Madison. The three round event is hosted by Madison’s 12-time PGA Tour winner Steve Stricker. Stricker partnered with American Family Insurance to bring PGA Tour competition back to the state. In just two years, the tournament has raised more than $2.7 million for charity and more than 100,000 fans came to watch. Fred Couples won last years event. Stricker, who made his debut last year, tied for third. Following a bogey on the 10th hole, Kirk Triplett followed up with birdies on holes 11, 13, 14, 15 and 16 to win the inaugural American Family Insurance Championship. Triplett still needed help from leader Bart Bryant, who delivered a triple-bogey seven on the 15th hole which cost him the lead and eventually the tournament. Triplett said he was getting ready to hit a chip shot on hole number 16 when he glanced up at a leader board. What he saw was his name atop the leader board with a one-shot lead. He went on to birdie 16 and increase his lead to two shots. The American Family Insurance Championship announced a one-of-a-kind foursome for the June 24-26 event at University Ridge in Madison. Green Bay Packers and soon-to-be NFL Hall of Fame quarterback Brett Favre, will join former Packers teammate and Badgers offensive lineman Mark Tauscher, two-time U.S. Open Champion Andy North, and event host and 12-time PGA Tour winner Steve Stricker for a 9-hole scramble. 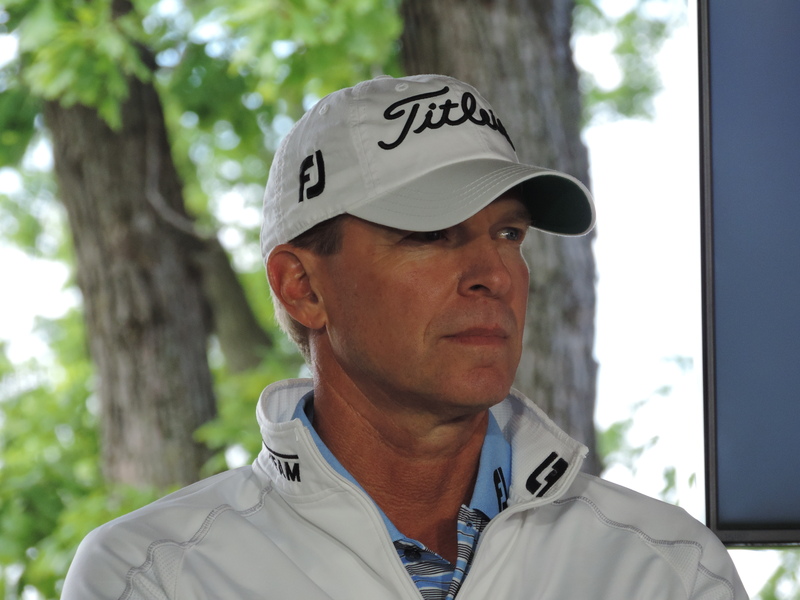 Wisconsin native Skip Kendall will play in the first-ever PGA Tour Champions American Family Insurance Championship, June 24-26, at University Ridge Golf Course in Madison. Kendall received a sponsor’s exemption from American Family. Kendall was born and raised in the Milwaukee area, before playing collegiate golf at UNLV. He then hit the professional golf ranks, winning four times on the Web.com Tour, and earning 26 top-10 finishes on the PGA Tour and three top-10 finishes on the PGA Champions Tour. Kendall also won the Wisconsin State Open in 1988 and 1989. Fans can purchase tickets for the American Family Insurance Championship at the tournament website at www.amfamchampionship.com.